We’ve had a wonderful, busy week! Top of the list was the private chef day for the BlogStamina blogger extraordinaire retreat led by dear friend Jenni Field of Pastry Chef Online! It has been held from April 4th - 6th, 2019, wrapping up today. She’s a force of nature and rockstar blogger who has taught me a thing or two herself! It was a great pleasure to cook for her and the participants - all of whom are stellar folks - including dear friend and (also prolific) local author Nancie McDermott. There were a host of fine talents enjoying the deeply conscious program created to enhance their blogging endeavors. The setting was a gorgeous spread of a home with cozy nooks and crannies as well as wide open views in Raleigh. I’m hearing rumors of possible additional dates/locations… Check out their site and social media for updates on their programming! The Blogstamina bunch wanted a gluten-free spread that everyone could enjoy, and we had a vegan entree option for vegan guest as well! Their meal consisted of a composed arugula-mix salad with layers of seedless cucumber, roasted beets, and shaved carrot drizzled with a scratch-made citrus-basil vinaigrette and blood orange/navel garnish; yellow jasmine seasoned rice; vegan quinoa with roasted organic veggies: rutabaga, eggplant, zucchini, and squash; Peruvian seared (organic, air-chilled) chicken ragout (using non-gmo corn). 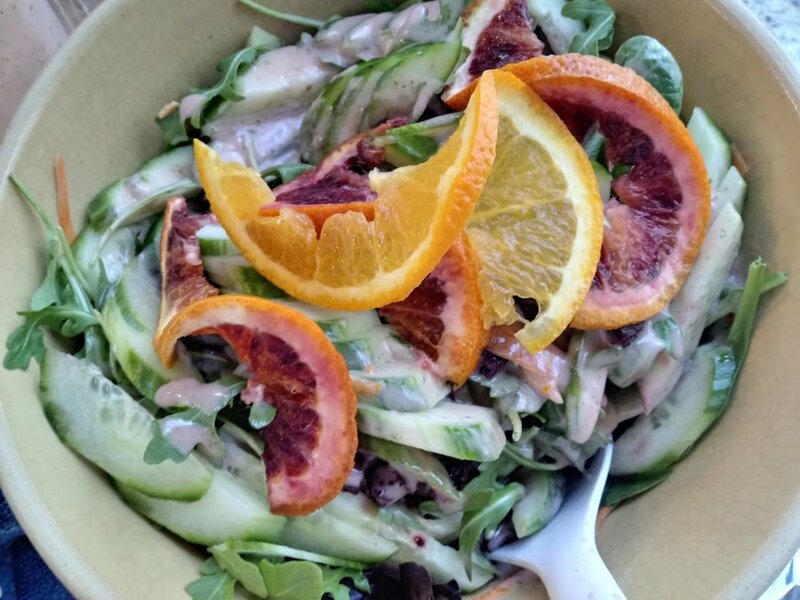 Composed organic and local salad layered with roasted, seasoned beets; seedless cucumbers and more… with scratch-made blood orange - citrus basil vinaigrette. LASAGNA IS ALL THE RAGE! We’ve noticed our eggplant lasagna really taking off lately! We have regular pickups at locations around the Research Triangle, NC area and also deliver for an extra fee. Maybe it’s the busy times, the positive vibes, or the delicious food, but we’re always happy to share or schedule a special round with 48 hours notice. Regular pickup day is Saturday afternoon. We recently had a busy professional mom wanting to get a jumpstart on the week, and delivered directly to her office fridge as a stress-free dinner for the family! (Fee for delivery based on location, minimums required.) Contact us to schedule a delicious, organic dinner! This will be happening Sunday! We've been looking forward to this a few months now! We're booked for Spring Bazaar 2019, and Carrboro Open Streets will be happening at the same time. 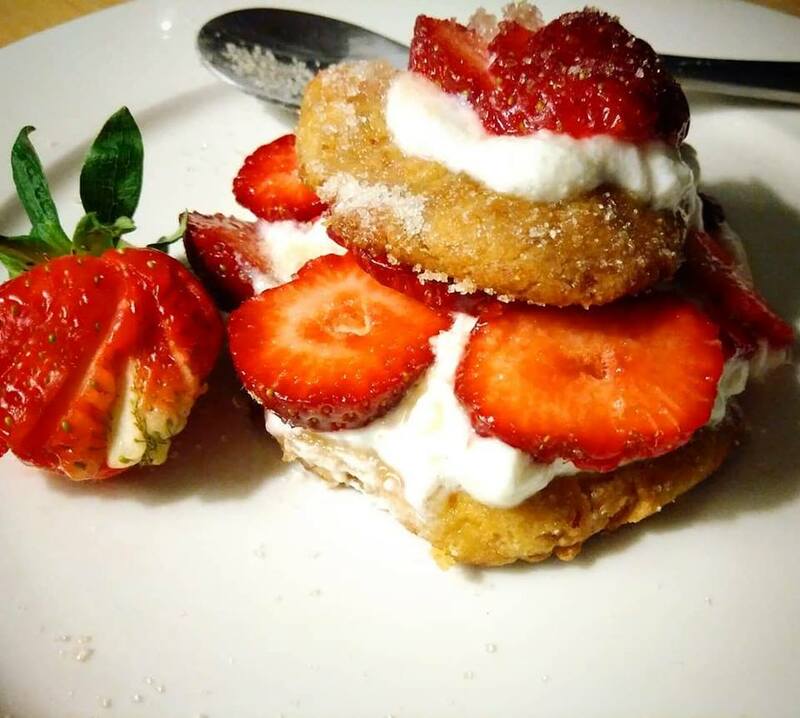 Sometimes we all need a touch of strawberry shortcake in our lives. (Non-dairy option available.) We’ll also have our seasonal strawberry lemon curd stackcakes on deck! If you had them last year, you know how good it is. Don’t miss our Strawberry Palooza - it happens when the strawberries are fresh, sweet, and in-season locally! Stop through and take some to go! That’s all of the updates for now! We’re heading to the farmer’s market! Stay close and stay happy! Get shoutouts for discounts, new items or locations, and events. We won't use your precious information for anything else!